Shikatani Lacroix revitalized the brand and elevated its imagery with an award-winning design and wordmark. We explored different wordmarks and designed a new bottle with a contemporary look and feel that speaks to the product’s value. The new bottle design won a 2015 Gold PAC (Packaging Consortium) Global Leadership Award, a 2016 Graphic Design USA Award, and a 2017 Silver Graphis Design Award. 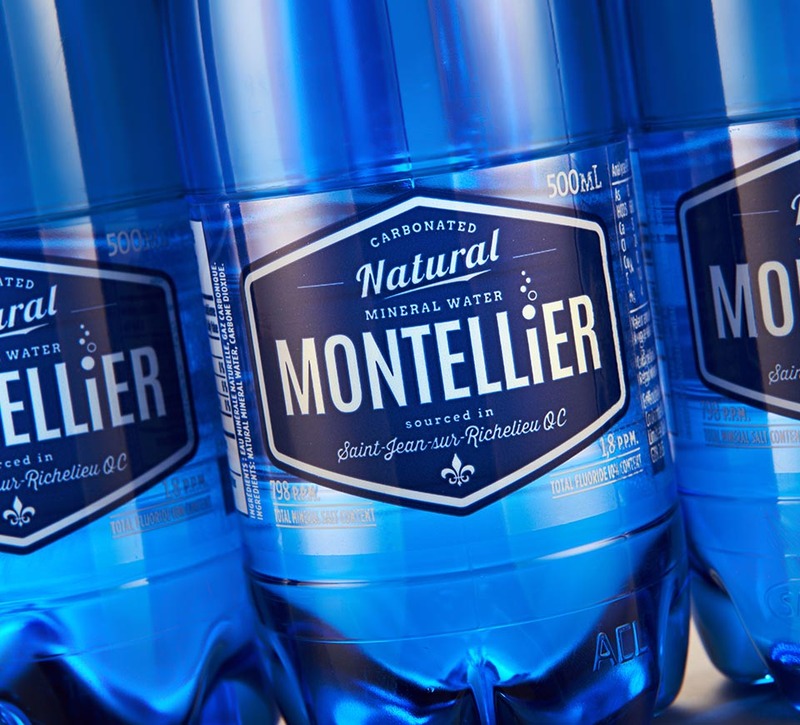 Montellier is a brand of sparkling mineral water sourced from an underground Quebec spring and is distributed throughout the country by Alex Coulombe Ltée and Pepsi Bottling Group. 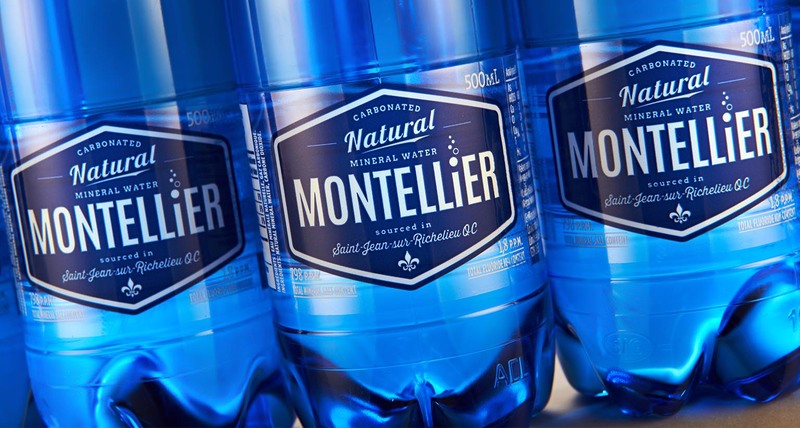 A light, delicate water, Montellier also contains a natural, balanced variety of minerals, and has digestive properties thanks to a wealth of bicarbonate, also naturally occurring. 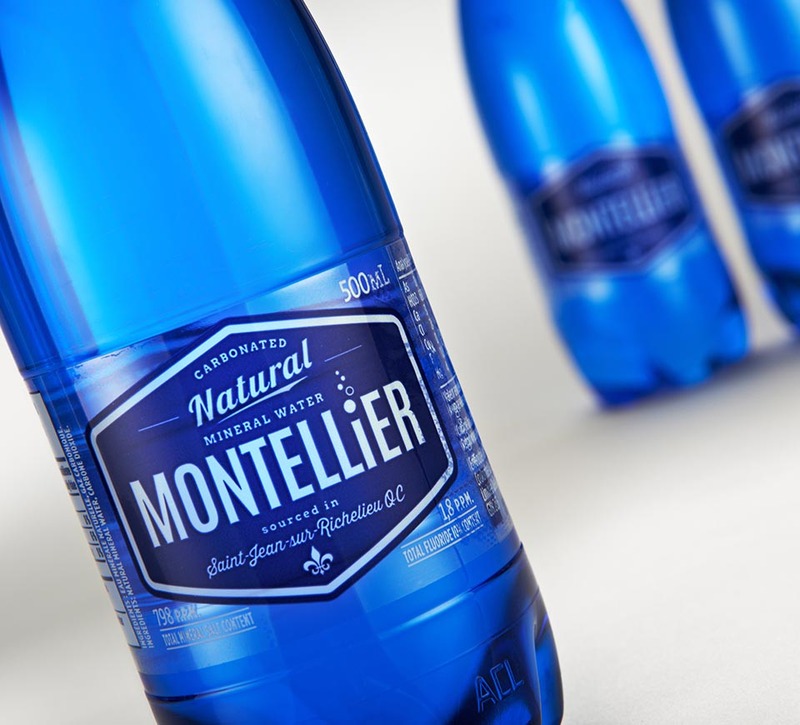 As the demand for sparkling water in Canada began to grow (47 percent from 2009 to 2014 according to Euromonitor International), the client wanted to elevate the market presence of Montellier. 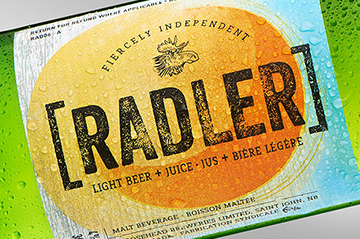 Shikatani Lacroix was brought on board to create a packaging design framework to revitalize the brand’s image and elevate its imagery with a new design and wordmark. 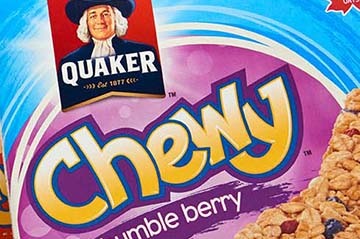 Shikatani Lacroix had to evaluate the importance of packaging factors such as color, shape and icon usage without directing Montellier too far from its original design work. 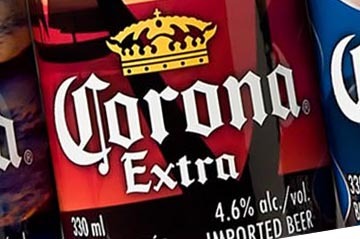 Although wanting to ensure the product stood out and that its quality was reflected in the bottle design, making a significant shift into the premium category was not desired. 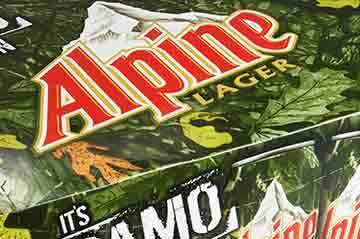 Additionally, the effervescent, refreshing flavor speaks to an engaging, social quality appropriate for any fun occasion, so the design needed to reflect this same energy. 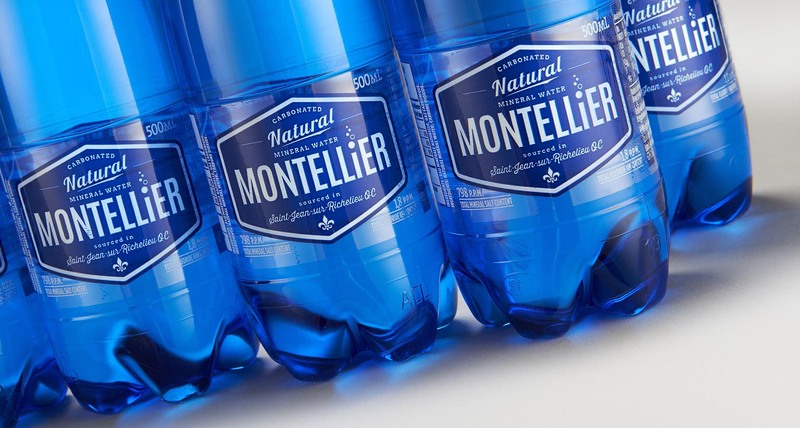 Montellier wanted to elevate the design of its bottle to a premium quality design that would appeal to younger customers and stand out at shelf level. In order to provide a range of evolutionary to revolutionary designs, we explored bottle shape, colour, wordmarks, and imagery. The location of the water source was an inspirational direction, which lead to images that captured the effervescence of the water. The client wanted to maintain the bottle shape so we looked to the wordmark and label to make an impact. We explored various ways to promote the elegant name, using fonts that felt clean and crisp. We designed a number of labels, including the shield shaped label, which not only has a strong, dynamic energy, but allowed us to enlarge the font in tall, narrow lettering. 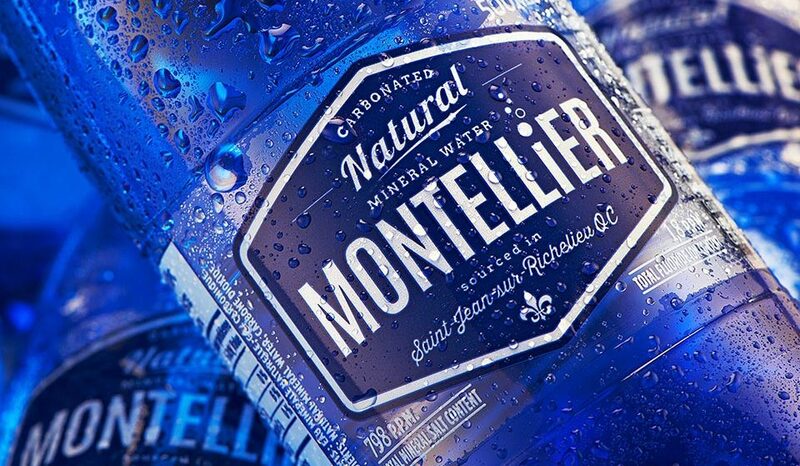 On the previous label, the source of the water was unclear so we included a fleur-de-lis, which is Quebec’s iconic provincial symbol, and highlighted the water source in script just beneath the name. We explored of a wide range of colours before deciding on a bright, deep blue, which was felt to encapsulate the refreshing, sparkling energy of the product in a colour that was less prevalent amongst the competitive sparkling waters in the market (which predominantly use clear or green-coloured bottles). 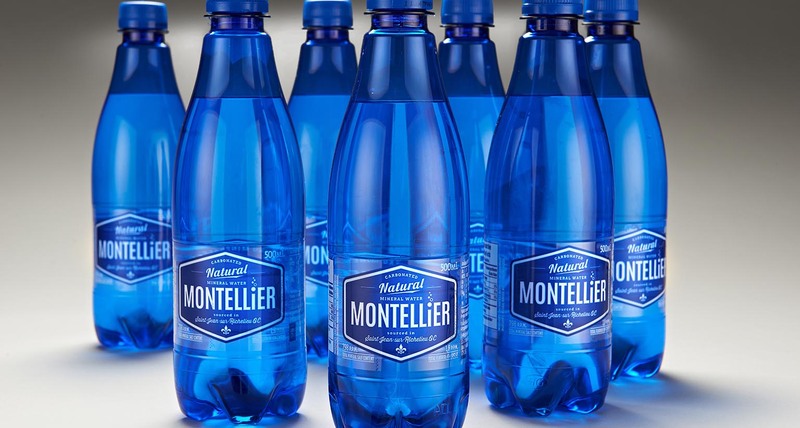 The blue feels clean and energetic, which also speaks to the social aspect Montellier wanted to reinforce – that this water is one to be consumed in engaging, fun, social environments. We offered the client twelve options, which showed a range of various elements we felt captured the core qualities of the product: the source spring, the refreshing effervescence of the water, and the kind of social environment in which the water could be consumed. As we narrowed down what we wanted to communicate, the shield shaped label on the bright blue bottle stood out as having exactly the right combination of elements. 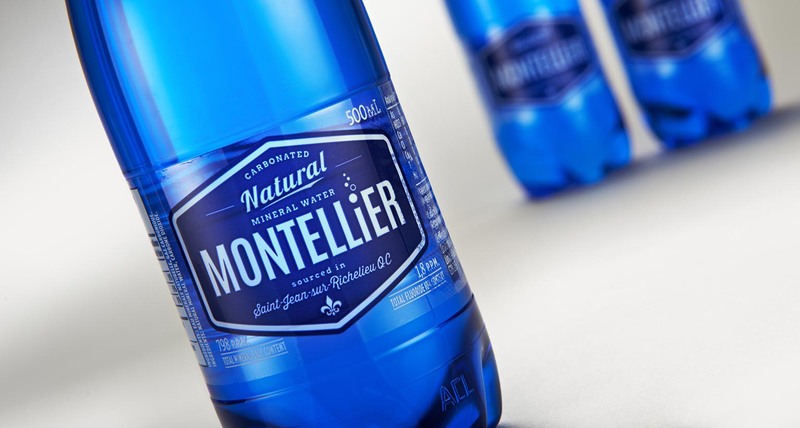 Shikatani Lacroix collaborated closely with Alex Coulombe Ltee and PepsiCo Beverages to successfully launch the newly designed Montellier sparkling bottled water products across Canada. 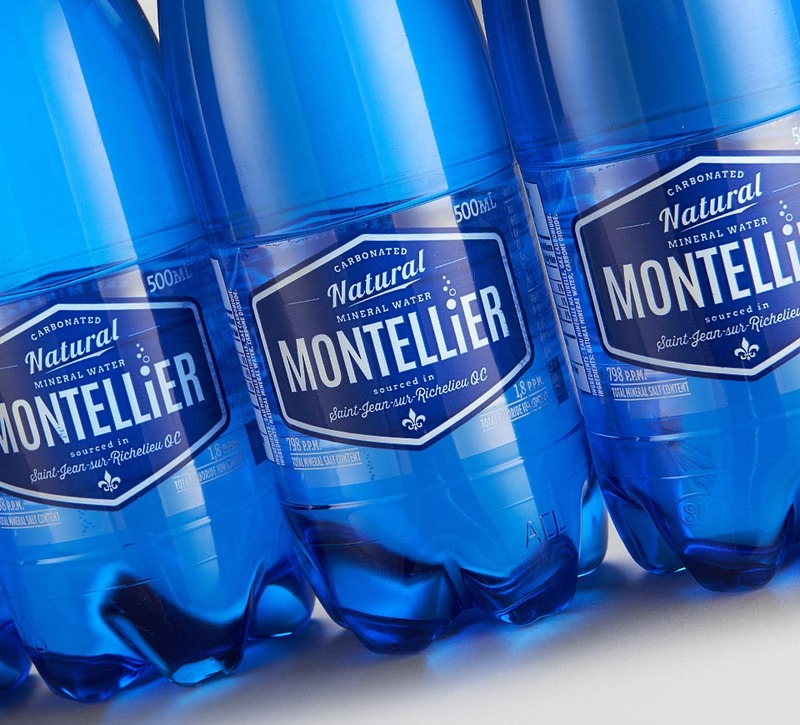 We revitalized the packaging by contemporizing the logo and enhancing the bottle colour, while maintaining the bottle shape and brand essence Montellier prides itself on. The design can be modified for future line extensions and product variants within its current packaging format. The design team designed packaging for Montellier’s lemon flavoured sparkling water by adding a hit of yellow around the brand’s logo. 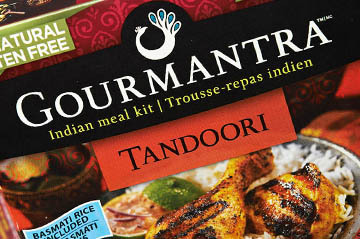 The final design has been a huge success for our client. 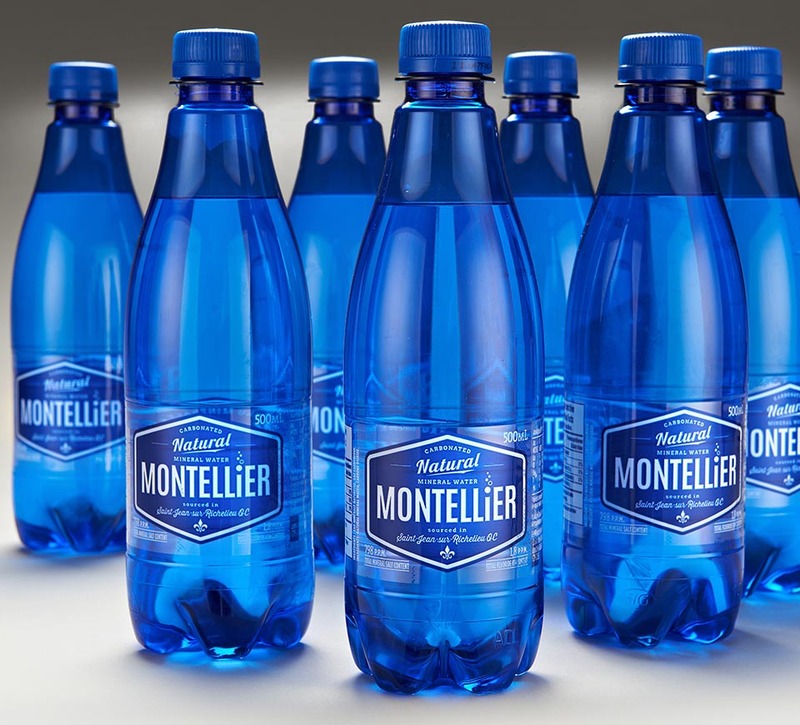 Sales of Montellier have increased significantly since the redesigned package launched. Year-to-date sales of the 500ml bottle have almost doubled.